1. The Yarn: I’m grateful that there have been not one but two MBA student blog posts speaking to the power of The Yarn this past year. If there’s one thing I want to be known for and to have as my legacy at Sloan, it’s organizing and continuing to grow the Yarn, a student storytelling event inspired by the Moth in which people from across the Sloan community tell true stories about experiences that shaped their lives. I’ve heard about near-death experiences and indescribable hardships, about inspiring moments of hope and stories of incomparable joy. It’s amazing what happens when you can create a safe, welcome space where people can be comfortable to be vulnerable and speak their truth. For an event that lasts a little over an hour and happens only three or four times a semester, it packs a serious punch in terms of seeing the bigger picture of your life and the bearing witness to the wholeness of your peers as people beyond their in-class personas. It’s not to be missed, and if you want to learn more, here’s a link to the YouTube page of past speakers’ stories, my own among them. 2. Camp Sloan: This is another experience that was a secret game-changer. Much like the Yarn, it doesn’t pack a big time punch when compared to the hours you spend on formal coursework but delivers in the quality of experience within a short period of time. Maybe it’s something in the water in New Hampshire, the beds we sleep in at the lodges, or the air up on the mountains the counselors make the campers hike the morning after a night of bonding. At any rate, these outings crossing all the programs at Sloan from MBA to Sloan Fellow to MSMS really set the stage for you to genuinely connect to your peers. Without the help or convenience of technology, you’re are uncomfortably, unconventionally, and wonderfully compelled to learn about the people around you very quickly and very intensely–for all the coordination required to make the trips go off without a hitch, Camp Sloan barely lasts over 24 hours. Camp Sloan this past year fell around fall midterms and spring finals, and I always got nervous that I wouldn’t finish whatever needed to get be finished before I get on the bus. But Camp Sloan was always worth it, and the thing always got done, even if it didn’t get done perfectly—and that’s ok. Adapting what I’ve heard in speeches by the universally-loved Roberto Rigobon, while I can measure the effort or time it took to do better on the assignment, I can’t measure the impact and the meaning of authentically connecting with classmates over a campfire far away from the E-62 cafe. In the end, people matter more than papers. 3. 15.282: enActing Leadership: I’ll be the first to say that acting and performance are more than within my comfort zone. They’re well within my “joy zone.” I was a comparative literature major in college whose independent work analyzed contemporary significance of classical literary texts and an a cappella singer who missed the thrill of public performance. Leaning toward the humanities, I came to MIT Sloan in order to balance out my skillset with a more technical lineup of electives. As such, signing up for 15.282 was a decision I made in part to offset the quantitative material in my schedule this spring after surviving the core semester. Given my background and interests, I thought I wouldn’t learn too much but would have a good time in enActing leadership. I also had to believe that the kinds of people taking this class were the kinds of people I would want to befriend during my time at Sloan. I’m pleased to say I was both right and wrong about this class in all the right ways: I was challenged in ways I never would have expected and grew more aware of my leadership style throughout the process by studying and performing Julius Caesar and by reflecting on how it relates to my future outside the Forum and in the executive suite. Ask anyone in the class—we all understand why theater companies are called “companies” after the 18 of us had to produce an abridged work of Shakespeare from start to finish, lights, music, lines, and all. Ask anyone who saw the show—we broke a leg or two and knocked ‘em dead. 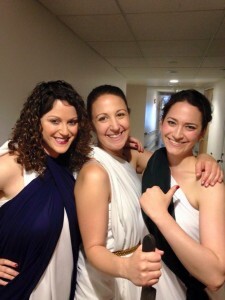 And looked great in togas. Darling ‘15s: congratulations again and wishing you all the best in your endeavors. Stay in touch! Beautiful ‘16s: I wish you continued joy and success throughout your internships and can’t wait to hear about your adventures come September.